A deeper look at the grooves pressed into the 2LP+1CD deluxe edition of the Singles soundtrack. While there are several great soundtracks which were released in the 1990s (the Tank Girl, The Crow and Great Expectations soundtracks all leap to mind), arguably the greatest and most culturally important of the lot proved to be that of Cameron Crow’s first “rock memory scrapbook” picture, Singles. 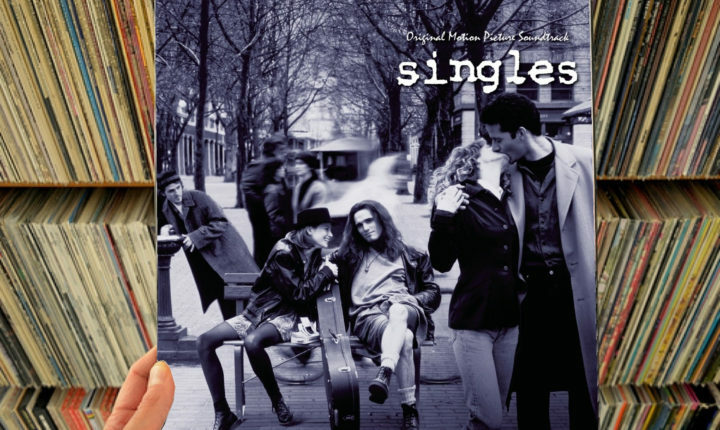 The reason for that is pretty easy to explain; released in 1992, Singles happened to come along as grunge was taking over the world (according to legend, the film sat finished and in the can for the better part of a year because Warner Bros. Had no idea what to do with it – but as soon as grunge broke,they found the marketing tactic they needed) and so rode the whirlwind of popular attention. Not only that though, the “still-more-underground-identified” contingent of college rock fans also got their fix with the help of the first new Paul Westerberg music released since the singer left The Replacements on this soundtrack as well as previously unreleased music from Pearl Jam and Soundgarden. When it was originally released in 1992, audiences happily embraced both the film and its soundtrack and, as time has passed, interest has never waned; unlike those soundtracks aforementioned soundtracks (which feature some of the same performers, ironically), the Singles soundtrack continues to generate new interest even twenty-five years later. As soon as a stylus is sunk into the A-side of this new deluxe edition reissue, it’s actually disconcertingly easy to fall under the spell of the bass line which drives Alice In Chains’ first anthem, “Would?”. Even now, twenty-five years later, there’s a sense of it being a grand, sort of “Welcome To Seattle” statement/invitation and it’s really easy to get excited. That’s one thing, but the really cool bit is that the energy set up even with that first cut stays up as the album progresses. Along the way, while listeners will realize there’s no possible way that the pacing of the album track-by-track could have been set the way it plays intentionally, each side of this reissue hits hard and explosively – “Dyslexic Heart” opens side two and lets listeners really savor the renewed-raucous energy that Paul Westerberg was exhibiting after the end of The Replacements while “Birth Ritual” really melts faces to open the C-side and the only moment of classicism (which plays out very regally) is the fairly subdued Jimi Hendrix number (“May This Be Love”) which opens the album’s D-side. In each of those cases, the energy of the album’s running gets nicely renewed and gears listeners up for the trip through another side and, by the time Smashing Pumpkins’ “Drown” ambles through to complete the journey, those who have gone front-to-back with the set might just find themselves ready to make another trip through it. That is not to say there are no lulls in the running of the vinyl where one may wish skipping a song was as easy as pressing a button on a CD player (the cover of Zep’s “Battle Of Evermore” contributed by Lovemongers is pretty tedious, as is Mother Love Bone’s”Chloe Dancer/Crown Of Thorns”), but there’s no question that running through this vinyl reissue is still a joy, whether listeners are old enough to feel nostalgia for it or not. Better still is that the vinyl presentation isn’t the only interesting thing about the 2017 reissue of the Singles soundtrack. As anyone who has ever seen the movie knows, there is a pretty incredible amount of music packed into the film’s running – well beyond the amount which ever appeared on any permutation of the soundtrack – but it existed nowhere outside the movie. Now though, in addition to the two vinyl plates presented in this set, Legacy Recordings has also included a CD featuring music which was in the film but didn’t originally make the cut for a CD. Hearing the full-length versions of some of the songs included here is simply glorious; the demoes made by Chris Cornell which ended up being transition music between scenes in the film (and one of which was a demo for “Spoon Man,” made two years before the song would appear on Superunknown) are a particular treat, to say nothing of the demoes made by Mike McCready, Mudhoney and Paul Westerberg which are all included here as well. Overall, the CD makes for a pretty decent souvenir in its accompaniment of the vinyl, in this case; it couldn’t really stand on its own (at heart, the CD is a “bits and baubles” affair) but it compliments the spirit of the vinyl and helps to make an already impressive set into one which should not be missed.